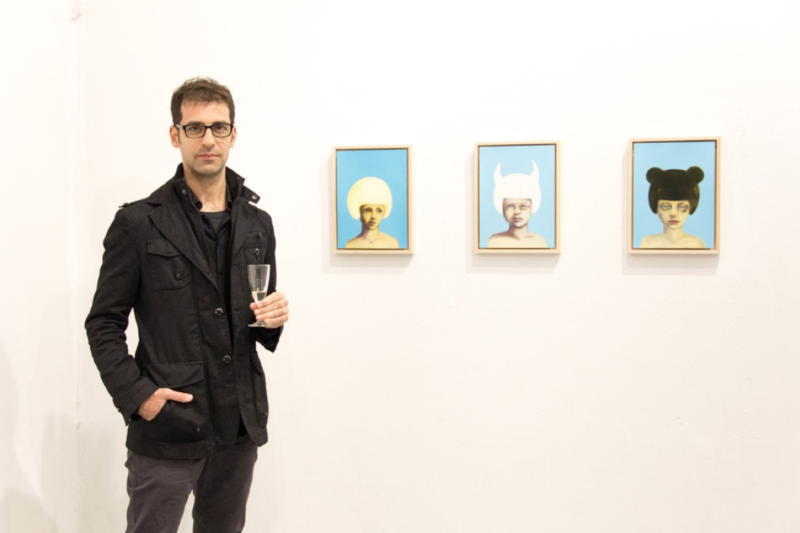 As a co-founder and active member in Alfred – A Cooperative Institute for Arts and Culture, I was enthusiastic when Amit Goffer, a colleague of mine who resides in Düsseldorf, Germany, contacted me in early 2015 with a gallery swap opportunity. 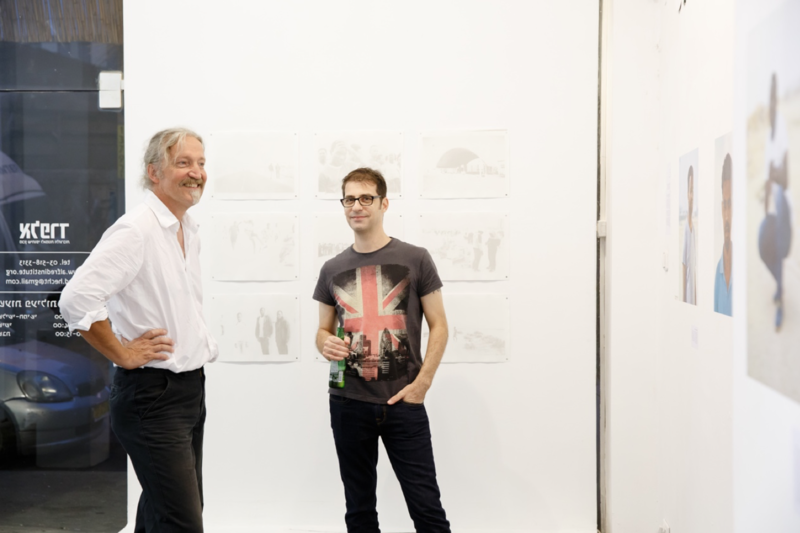 As a cooperative, Alfred Gallery is always looking for exciting collaborates. Up until that very moment, our collaborations were with local projects, thus, the opportunity to expand our activities overseas was very appealing. 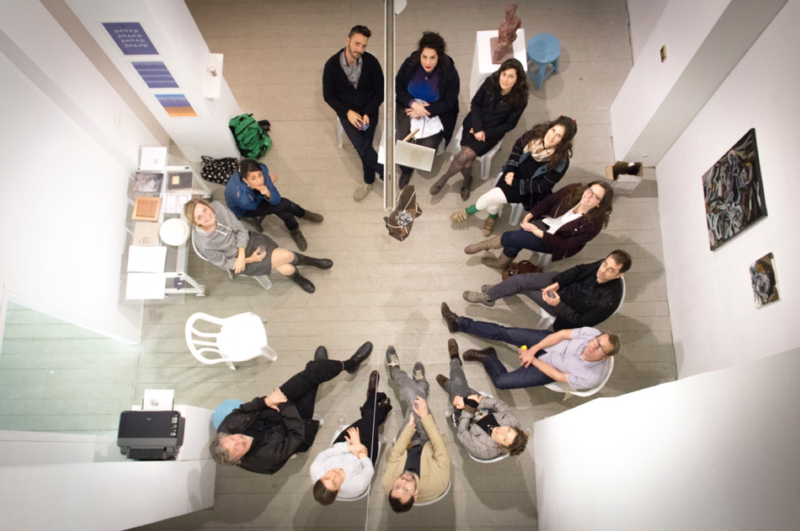 Alfred – A Cooperative Institute for Arts and Culture is an alternative space – a home to a vibrant arts community, which brings together the art-loving audience with contemporary art and young creators. The establishment of the institute’s success was preceded by Alfred Gallery, opened on September 2005, which was a pioneer of the cooperative trend in the Israeli art field and served as a model of cooperative activities for other galleries that were established throughout the country in recent years. 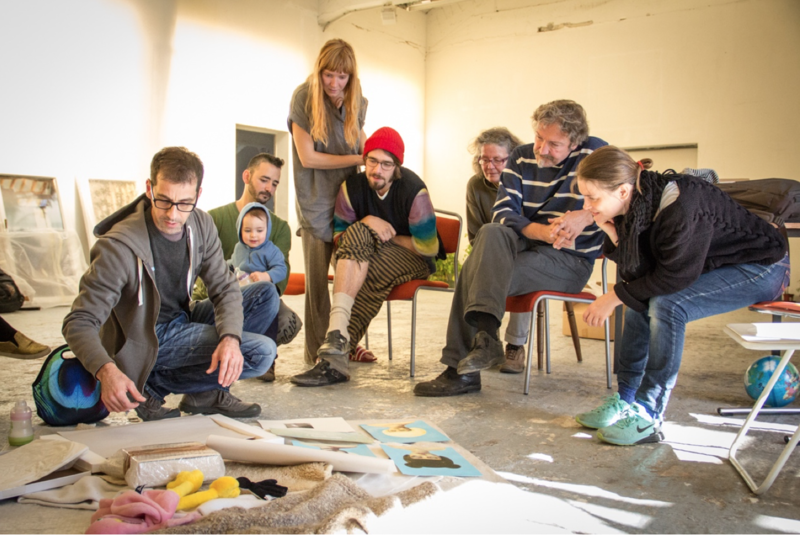 After eight years of fruitful activity in south Tel Aviv, in 2014 Alfred – A Cooperative Institute for Arts and Culture was founded. 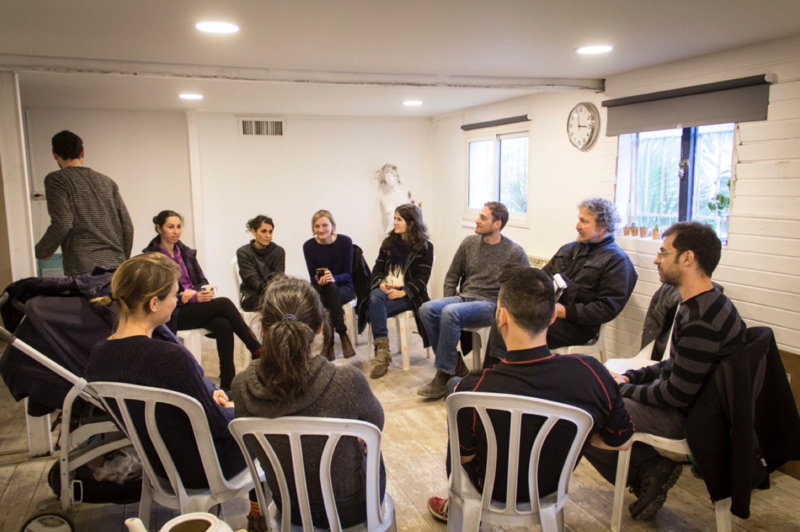 Set in a 3.5-story building, entirely dedicated to promoting and supporting young Israeli art, the institute operates as a non-profit organization as it had since the very beginning. The main activity of the cooperative Institute is Alfred Gallery, opening a new exhibition every month. In addition, in the cooperative institute there are 14 studios occupied by 20 artists working in different fields, workshops are being held in visual arts, creative writing, etc., and art and cultural events are held. 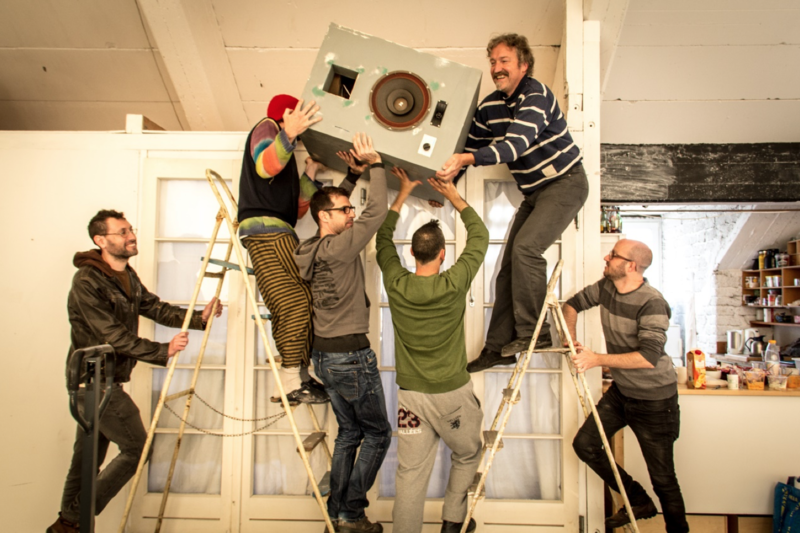 Amit Goffer introduced us to the BETONBOX – a cooperative gallery since 2010. At the time they consisted of three members. The location of the gallery space is in a bunker that was used during the Second World War. That sounded more than intriguing. After a few friendly emails, where representatives of both cooperatives were showing positive intentions, it was time for our first Skype meeting. There are several things when talking to a person face to face (even digitally) that cannot occur through emails. We all clicked immediately. Our mutual good intentions were revealed through unspoken gestures – it just felt right. Now that everybody is happy that we are making new friends abroad, we decided that in the first stage of the cooperation a team of five artists from Alfred Gallery would travel to Düsseldorf. In Düsseldorf, we were to form a joint exhibition consisting of the Alfred Gallery artists with the BETONBOX artists, in addition to a few more German artists from Düsseldorf, as well as Amit Goffer and his lovely wife and artist Vera Lossau. Our arrival was planned to September 2015. The second stage of the cooperation was that on January 2016, our German colleagues were to come to Israel and that we will open a joint exhibition in Alfred Gallery. In the meanwhile, we had to cook up a concept for the exhibitions. Our German colleagues suggested the term Lichtung (I could never pronounce it right) as a title for the exhibition in the BETONBOX. Lichtung is a common concept in the German language, which freely translates to “clearing”, as in “a clearing in the woods”. However, it is also a common concept in Heideggerian terminology. On the one hand, it’s a vast concept that allows various possibilities of interpretations, on the other, just few months earlier, Heidegger’s Black Notebooks were exposed revealing explicit anti-Semitic content. For many of my colleagues in Alfred it seemed as a distasteful choice of concept. Since I was the one who was with direct contact with our German colleagues, I trusted that this was not a cynical or a provocative choice, but rather an opportunity for a cultural discourse. After an on-going internal dialogue, the Alfred artists decided to proceed with this concept. 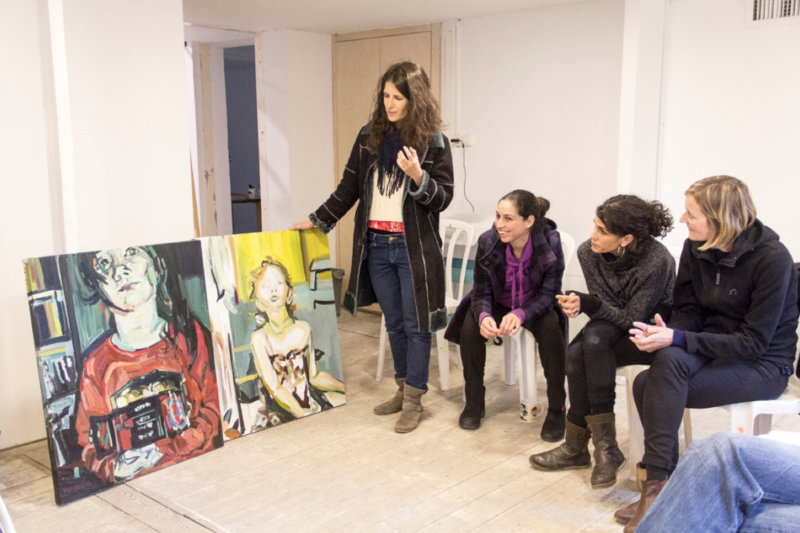 Israel, as a militant country, has very few funding programs for cultural events, and our project did not fit to any category for financial support at the time. Fortunately, our colleagues from Düsseldorf had much better luck. They did an amazing job raising subsidies for our project, allowing them to afford to pay for our flight tickets – their generosity was overwhelming. In summary, this cooperation was part of the program of the Foreign Office, the Robert Bosch Stiftung and the Goethe-Institute on the occasion of The Fiftieth Anniversary of Diplomatic Relations Between Israel and Germany. The project was enabled through the generous support of federal state NRW, the Embassy of Israel and the Cultural Office of Dusseldorf. Now that everything was in motion, each artist retreated to their own studio, to work feverishly on their project. 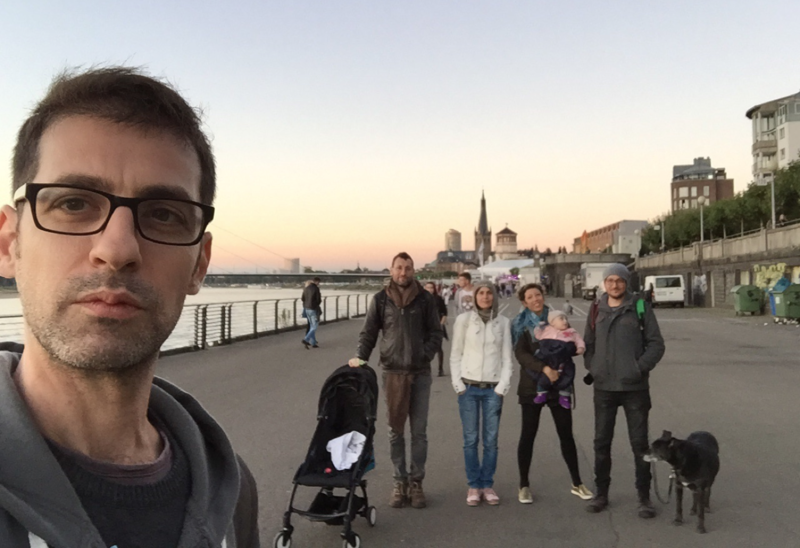 The Team of artists who travelled to Düsseldorf were Gidi Smilansky, Rotem Ritov (and their newborn daughter Laila), Adi Levy (our member from Berlin and his dog and best friend Monty), Dafna Gazit (my beautiful and talented life companion), and yours truly. Upon arriving to Düsseldorf, we were greeted by our local colleagues with a well prepared feast, with friendly consideration to some of our Vegan members (including myself). After a hearty meal and a few beers, the ice was broken and personal friendships started to form. Our hosts hosted us in their homes, which were big enough to allow every one hers or his own privacy, and thus the relationships between us grew stronger as we bonded on personal levels. We had amazing breakfasts together, tipsy dinners, and great conversations. The next day we had a meeting where everyone exposed his or her own works, as well as exposing the works of our colleagues who stayed in Israel. We took the opportunity to discuss the choice of concept and to bring up our ambivalent position. Apparently, they were experiencing the same ambivalence, and an enriching cultural discourse developed. We wanted to exhaust the visit to the fullest; beyond the formal opening of an exhibition, we decided to have a video art screening exposing contemporary video artists in Israel, and a preview event for the exhibition in which an Israeli meal was served to the guests. 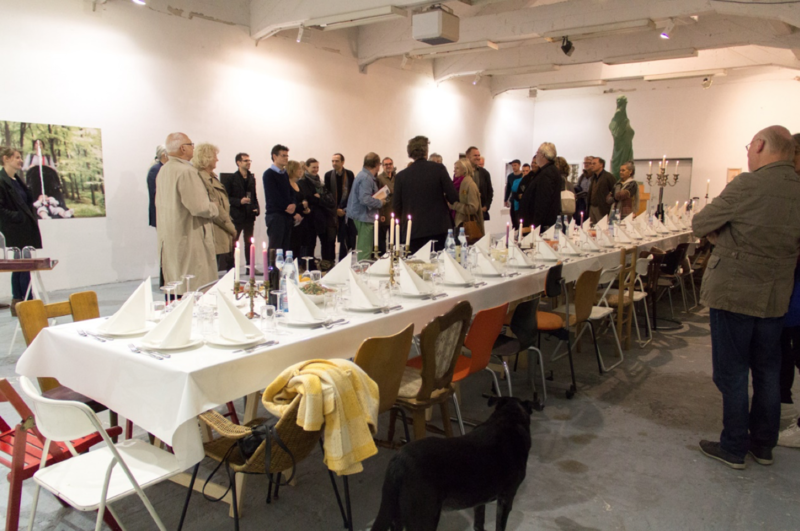 In addition, a panel discussion was held on Tuesday, 20th October at the Kunstakademie, Düsseldorf. Moderated by Prof. Robert Fleck, representatives of both artist collectives discussed the situation and promotion of contemporary art in Tel Aviv and Düsseldorf and their concepts and practices as non-profit initiatives in both countries. 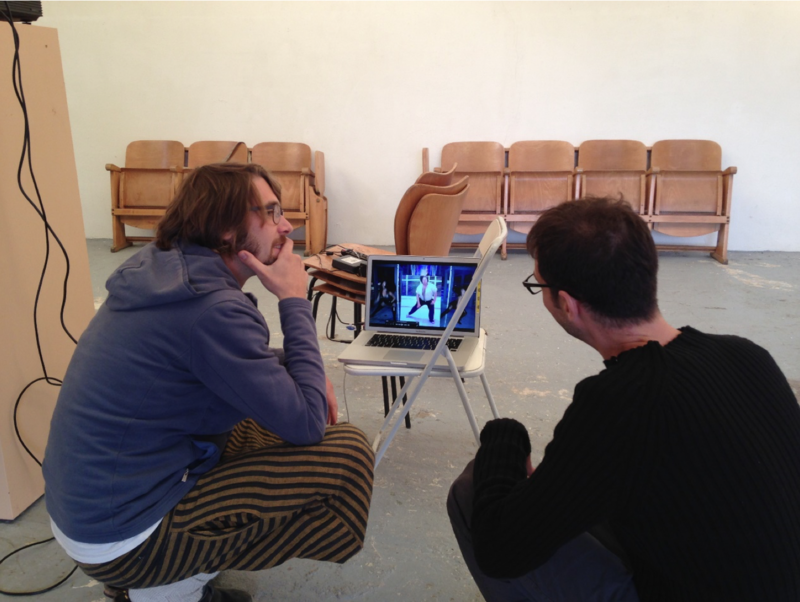 Florian Zeeh and myself working on the playlist for the video art screening event. Enjoying a glass of wine next to my works minutes before the opening event. 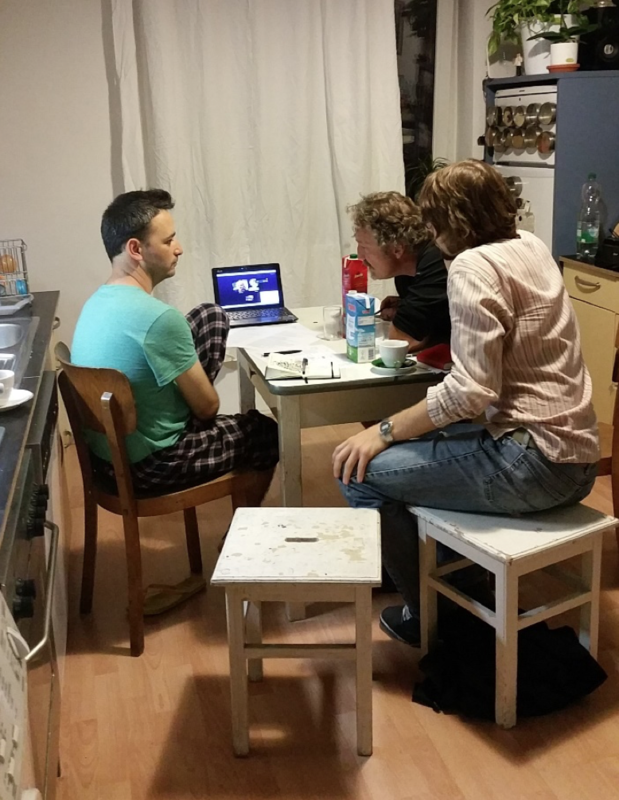 Fast-forwarding a couple of months, and now our roles have changed – the guests became the hosts. Since none of us resides in spacious apartments, we just could not host our guests at our homes. Therefore, we had to be very creative. A few weeks before their arrival, we asked friends, relatives and colleagues if they are willing to host our guests. Here we saw how fruitful Alfred’s activities for the community really is. 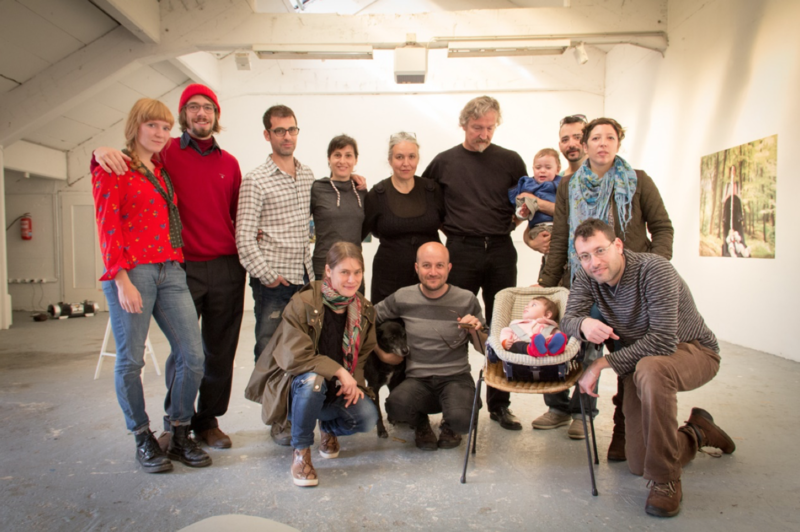 An artist, who exhibited once in our gallery in a group exhibition, offered a spacious two-story apartment that housed two couples including their children – pro bono! Another friend of a friend opened her home and hosted one of our guest. We did have to deal with an uncomfortable situation where a commune, that we hardy knew, said that they had an extra room for a couple. Our guests felt very uncomfortable spending there a second night, so we had to find a quick solution – and we did – today everybody remembers it as a little adventure… I hope. Coming back to the title of the exhibition, we all decided that it would be best to change the title in Israel to the English translation – Clearing. It was not because we felt concerned about dealing with a controversial concept, but rather we did not feel that any of us really dealt with the political connotation it arises, and that felt irresponsible, and kind of amateurish. So Clearing it was. In addition to the main opening event, we planned a preview event, similar to the one we held in Düsseldorf, where curators, gallery owners, and art collectors were invited for this special event. We organized three panel discussions in Shenkar College of Art, The NB Haifa School of Design, and Ashdod Art Museum. Representatives of both artist collectives discussed the situation and promotion of contemporary art in Tel Aviv and Düsseldorf and their concepts and practices as non-profit initiatives in both countries (yes I did copy-paste this last sentence from the paragraph about the panel in the Kunstakademie, Düsseldorf, only because it’s exactly what we did). Contrary to common belief, artists actually work better on a full stomach. We threw a picnic in Alfred’s back yard. 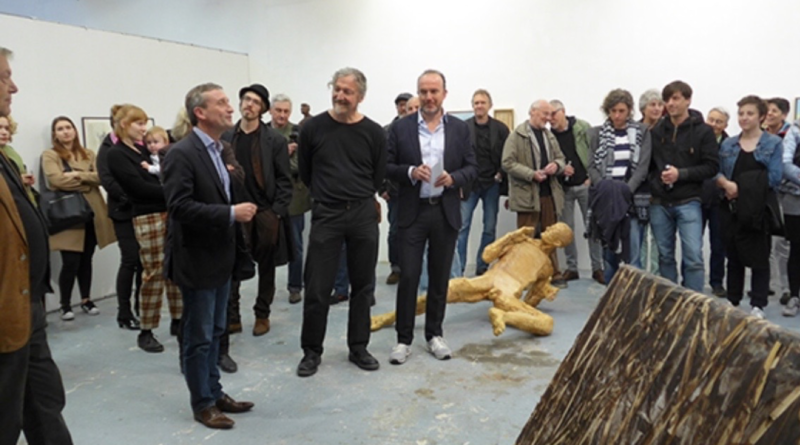 It was a good opportunity to mingle, and for our BETONBOX colleagues to meet and interact with the rest of the Alfred gallery artists who were not in Düsseldorf. 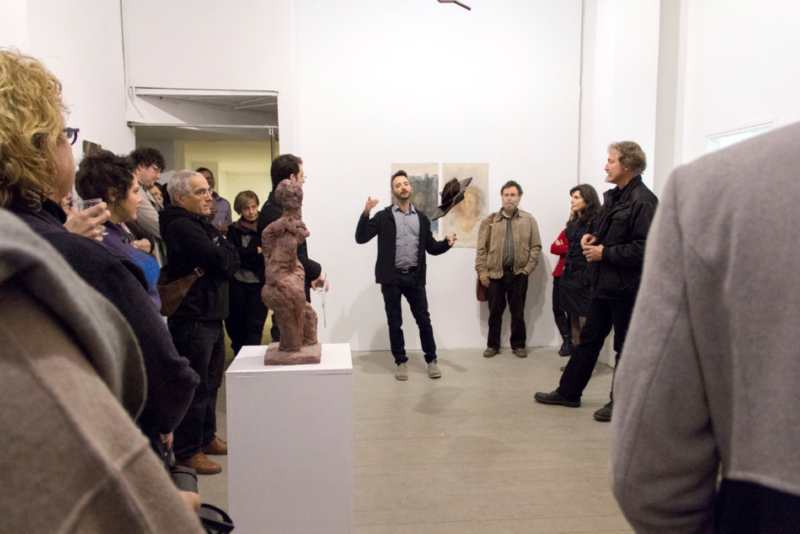 First meeting in Alfred Gallery, January 2016. Alfred Gallery artist Talya Raz exposing her work she for the exhibition. From left to right: Talya Raz (Alfred Gallery), Noa Lieberman (Alfred Gallery), Mavi Garcia (BETONBOX) and Nathalie Bertrams (BETONBOX). Nathalie Bertrams (BETONBOX) translating from English to German to Mavi Garcia (BETONBOX) who speaks only German and Spanish. The language barrier with Mavi was a non-issue – she is such a great person and we became very good friends. 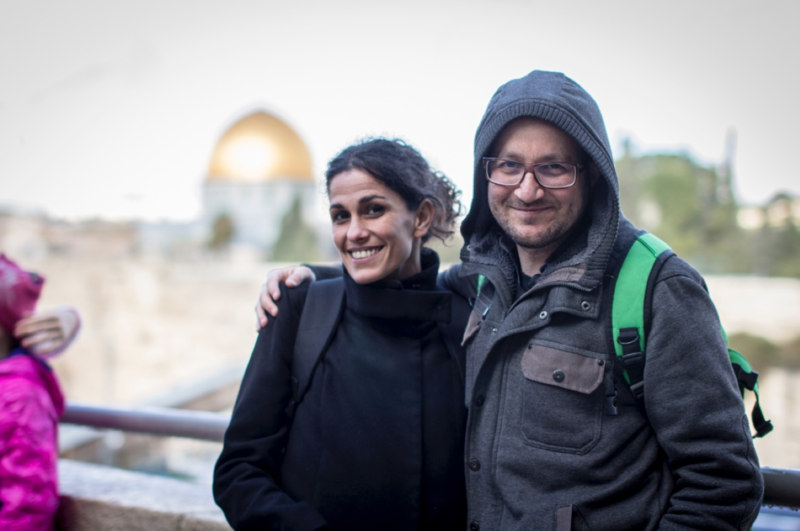 Mavi Garcia (BETONBOX) and Adi Levy (Alfred Gallery) in Jerusalem. Amit Goffer presenting our collaborative project in the opening event. Our final meeting in Alfred, afterward we all went out for drinks. The original plan of the cooperation between the two cooperatives was completed. However, in view of the enjoyable and enriching experience, we felt that we wanted to continue to cooperate. I would like to stress that beyond the professional experience, it was important for me on a personal level to stay in touch, and to continue working with my newfound colleagues and friends. After a short period where everybody retreated to their own daily routine, Bernhard Kucken contacted me, and told me that they had a meeting in the BETONBOX and that they were all feeling very excited after their return from Israel, and that they would definitely like to continue with our cooperation. In fact, that was the title they suggested for our second chapter of our cooperation: KONTINUUM. I presented their proposal to my colleagues in Alfred, we played a little with several concepts and options working around with KONTINUUM as a center of focus. After several emails and skype chats, we decided that we would form small groups of two or three artists, each consisting of members of both artists’ associations, and work together on a shared project. Practically, the groups communicated via digital means, mutual concepts were explored, discussed and established. Finally, the works were realized in the artists’ own studios and in a joint preparatory period in Düsseldorf, resulting in a mutually curated exhibition in the BETONBOX gallery space. We arrived to Düsseldorf on April 2017. This time we were a group of seven artists from Alfred who flew to Düsseldorf. We were Dafna Gazit, Dvir Cohen-Kedar, Adi Levy, Talya Raz, Rotem Ritov, Avner Levinson and Yoav Admoni. I worked with Bernhard Kucken (BETONBOX) and Avner Levinson (Alfred). We began by brainstorming through emails. Each one of us wrote about what was the main theme or concept that we were feeling passionate about at that point in time of our artistic careers. Both Bernhard and Avner are Sculptors while I am a painter (needless to say that both sculptors have professional drawing skills and that I had my share of experience with sculpting). In one of the emails, Avner suggested we relate to the statue of Laocoön and His Sons as a common starting point. Intuitively we all felt that this was a great choice. Besides the mythological story of Troy, the statue holds may possibilities of intellectual interpretations: the concept of tragic heroism, the complicated relationships between a father and his sons, self-sacrifice, etc; as well as artistic interpretations such as perception of space, composition, etc. The title of our project was Lament for Laocoön. 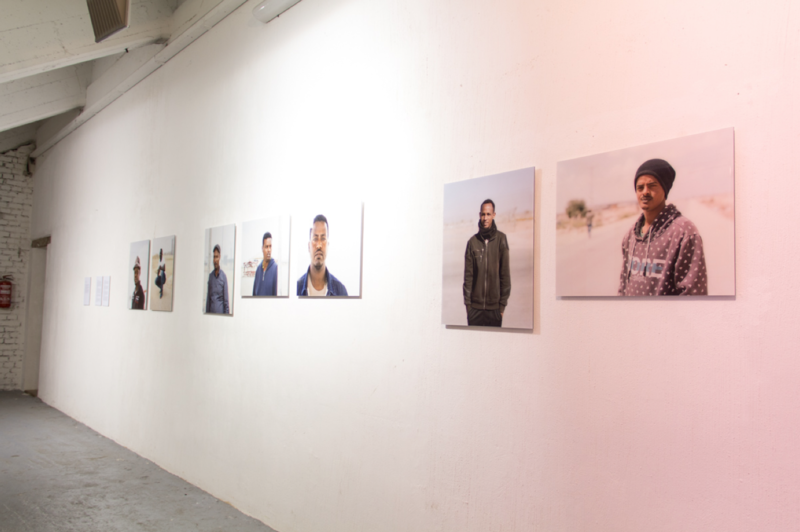 Dafna Gazit (Alfred) and Nathalie Bertrams (BETONBOX) created a portrait series of African migrants that are held in detention centre Holot in Israel titled Outcast, shot with a large-format camera in an open air ‘studio’ in the Negev desert. 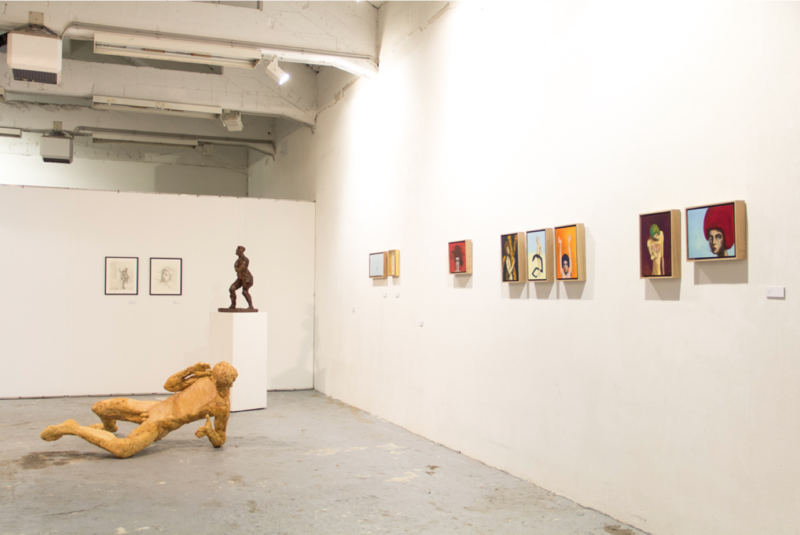 The exhibition consisted of large color prints and handmade gum bichromate prints produced by the artists. The intention of the project is to humanize and individualize the refugees, which the Israeli government has labelled “infiltrators” and to shine a light on undemocratic and inhumane dealings with migrants that are also taking root as political practises in Europe. Talya Raz (Alfred), Mavi Garcia (BETONBOX) and Ruth Mensah (BETONBOX) exhibited performance art, titled ‘I Remember’, each artist created a private space, a world hidden behind a black curtain. Inside their confined spaces, they carried out various actions, which were broadcasted to a television screen in real time. The work, which relates to issues of privacy and sharing in the online world, was presented in the exhibition on three separate screens, each of which provided a glimpse into their inner world. 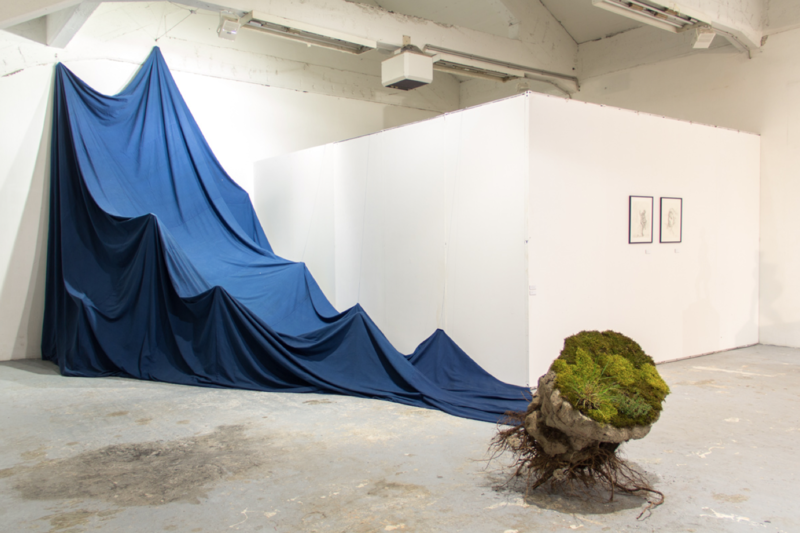 Yoav Admoni (Alfred) and Hyacinta Hovestadt (BETONBOX) exhibited sculptural works that relate to representations of nature and landscape. Admoni refers to the Israeli nature and reduces it to a size of a capsule. Hovestadt exhibited an abstraction of a landscape that examines how it falls apart and builds up by repetition. Susanne Hille (BETONBOX) and Rotem Ritov (Alfred) created, individually, goddesses from imaginative personal mythologies: one in the Middle East, Adalaad, and one in Europe, Kerlyssate, both acting in a contrary manner with regard to disasters, wars, conflicts and the human evil in general. 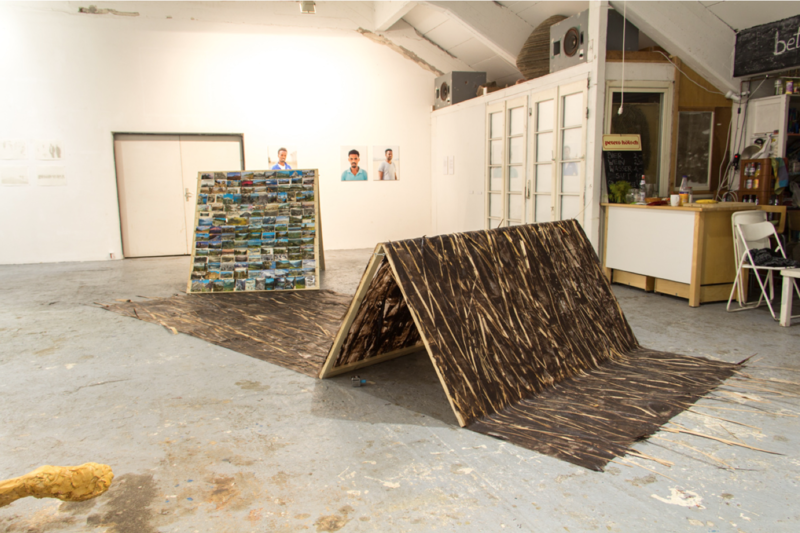 The installation is a combination of two tents, the deities` temples: Kerlyssate`s tent is made out of written postcards and is placed partly on Adalaad’s ground, an earth tent, made of plastic foil, glue and burnt umbra pigment. The cooperation between Adi Levy (Alfred), Mareike Piepel (BETONBOX) and Florian Zeeh (BETONBOX) has been created around the mutual sharing of intimate experiences of the past year, related to the blossoming and withering of the lives of loved ones. Each of them expressed the ongoing inner process within a shared space. Our second coming to Düsseldorf was very different. We came back as friends, and we were familiar with the city. Some of us took an Airbnb apartment, while others were hosted in the BETONBOX itself – it is such a huge space. The opening event was packed. Thomas Geisel, the mayor of Düsseldorf, arrived and praised our cultural cooperation. We were interviewed for a local radio show about art and culture, and received some T.V coverage as well. We felt that we are growing together as artists, while giving a nice boost to our careers. 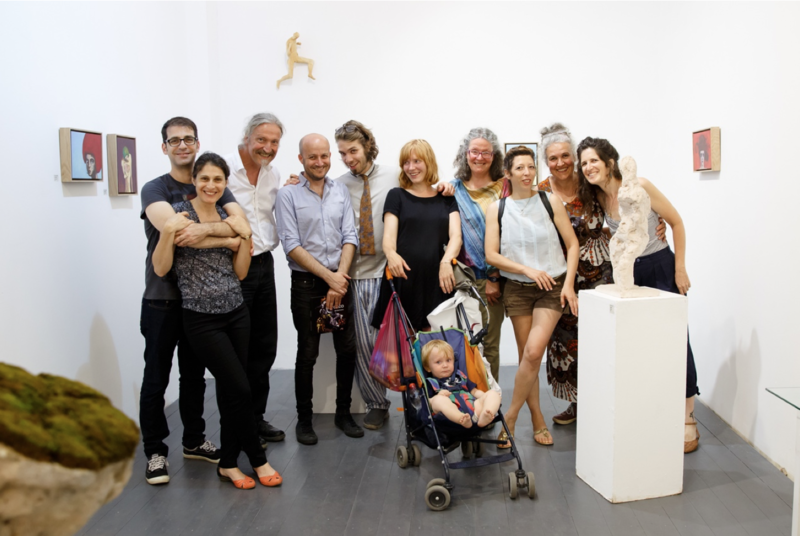 Just like the first part of the project, it was time for our colleagues from Düsseldorf to come to Israel for our joint exhibition in Alfred Galley. Bernhard Kucken received a residency in Ein Hod – an artists’ village in Israel, and arrived at around June 2017, the rest arrived on July. Nothing prepared them to the intense heat and humidity of a typical Israeli summer. One of the assets of Tel Aviv is the beautiful seashore, so they could take advantage of it to cool themselves up. Just as we arrived more prepared to our second coming, their visit felt very natural and extremely friendly. We all had great experience working together, we all earned each other’s respect, and we had our mind set to have a great show. Even though the concept was the same as in the exhibition in Düsseldorf, a few changes have been made: Bernhard Kucken, who exhibited a huge sculpture in Düsseldorf, produced a series of small sculptures making it easier to travel with; the performance by Talya Raz, Mavi Garcia and Ruth Mensah was played on three screens one on top of the other; Susanne Hille and Rotem Ritov created a memorabilia stand for their two goddesses; Yoav Admoni and Hyacinta Hovestadt gave a different visual interpretation to their project; etc. Chapter Seven – The End? No, this is not the end. We are already discussing future collaborations. Better yet, through this collaboration, we have all made connections that are becoming influential for our careers as artists. 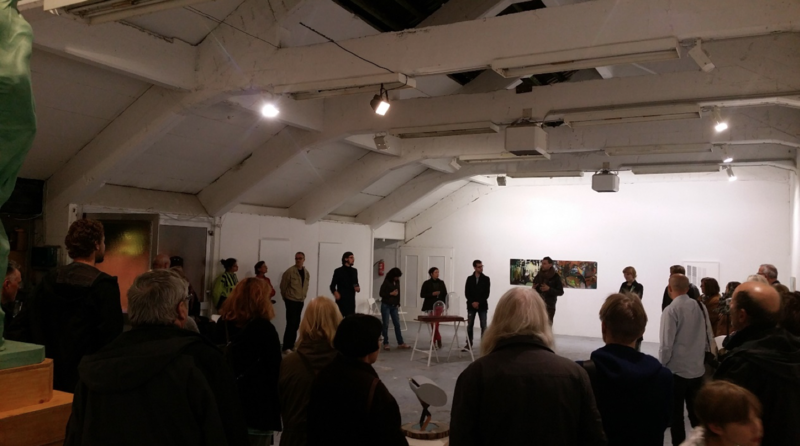 Some of us were invited to take part of exhibitions, residency programs and events. In addition, we are all looking to expand our collaboration and to connect to more artists’ run spaces in different parts of the world.